As a leading pan-European solution provider in the fields of power electronics and thermal management, AMS Technologies could not miss PCIM Europe from 5th to 7th June 2018 in Nuremberg. Visit us at booth 256 in hall 9. AMS Technologies partners with NWL, one of the largest manufacturers of film capacitors in North America and a world leader in water-cooled DC link applications. Company representatives will be at our booth at PCIM. Based on polypropylene film with electrical grade aluminium foil and state of the art metallized film, NWL’s custom engineered capacitors are extremely well suited for high reliability applications including pulse power, variable frequency motor drives, induction heating and melting inverters, high energy weaponry systems, medical and traction power. Do you already know our Capacitor Questionnaire? It will help you submit your request. AMS Technologies has a broad range of sensors that can be employed in a huge number of applications, from industrial washing machines to systems for current measurement in particle accelerators. Our high precision HF current transformers use a non-destructive and non-contact technology and can be employed to measure currents from µA up to 25 kA over a frequency range of 0.5 Hz to 500 MHz and beyond. With a large range of different plastic and metal materials for stem and float, the liquid level sensors are suitable for use in many fluids, including corrosive acids, and can often be employed at temperatures of +120 °C. The flow switches are designed for use in liquid flow systems at pressures up to 10 bar and temperatures up to +85 ºC. Whatever you need to measure, control, log or indicate, our pressure, temperature, level and distance transducers are also available. Key components of a water cooling system for power electronics are available from AMS Technologies. Pump stations feature reliable operation, 5 years maintenance intervals, compact dimensions, small footprint, measures preventing corrosion and extending pump lifetime, temperature control via 3-way-valve and more. Heat Exchangers are customized to the application and feature efficient stainless steel tubes, marine grade robust fins and more. Cold plates are available with homogeneous temperature profile counter-current flow paths or high performance micro channels, typically friction stir welded. Cold plates made of hot-rolled aluminum metal sheets feature substantially lower weight compared to conventional cold plates made of aluminum profiles. AMS Technologies supports you with a custom design aiming at low pressure drop and thermal uniformity over a large surface. This cost-effective technology is ideal for applications like cooling of batteries in transportation & traction. Come to our booth and see some cold plate samples that are suitable for battery cooling applications. AMS Technologies has been working for many years with Caddock Electronics. 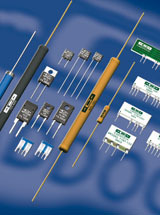 We are proud to show their precision resistors and resistor networks also at this year’s PCIM. Based on unique resistance film technologies and process technologies, the product line comprises over 250 models, including high voltage resistors, current sense resistors, chip resistors, high frequency resistors, rf resistors, load resistors, pulse resistors and non-inductive power resistors. We have already integrated Caddock’s products into the most different applications, including the design of custom products according to project requirements.